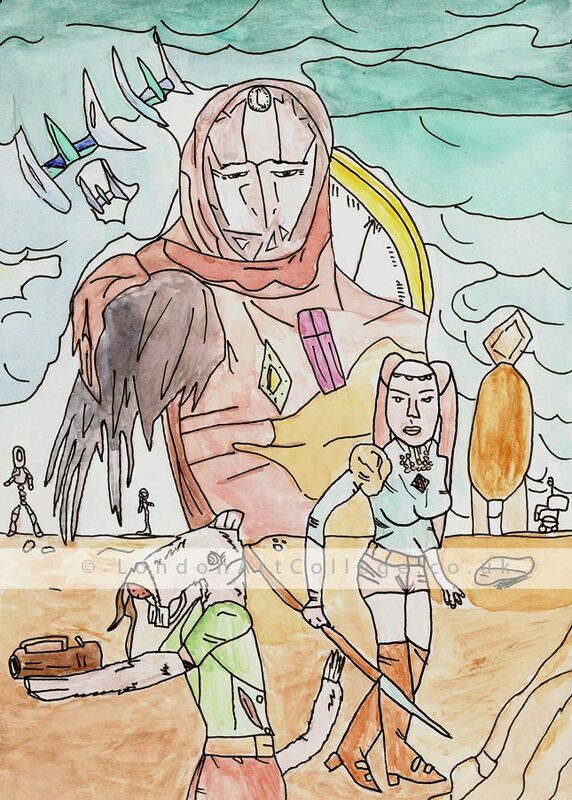 Jennifer Leach is currently working with tutor John Byrne on the Science Fiction and Fantasy Online Art Course. Jennifer has created her illustration below using traditional media, however students are more than welcome to use digital mediums on this course too, along with a mix of both. If our students and readers enjoy illustrating Science Fiction / Fantasy style artwork, there are lots of inspirational artists showing their work on IllustrationWeb.com. You can see a mixture of traditional artwork and digital displayed and we guarantee the artwork will spark ideas for your own work. We particularly like the work of Illustrator Nick Price who created all of the Womble Illustrations along with many other characters for Children’s books. Definitely a must see! Congratulations to Veranika Andreyeva, who has successfully completed the Botanical Painting Online Art Diploma Course with Distinctions. 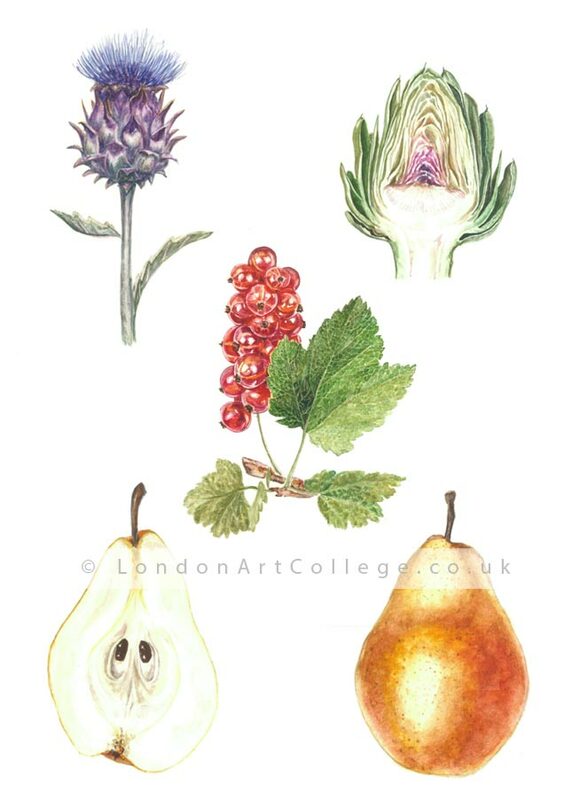 We have collated 5 of Veranika’s botanical paintings below, we absolutely love them. 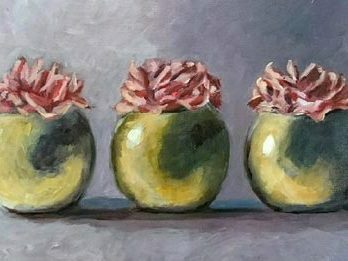 If you are interested in Botanical art and would like to find out more about the subject you might like to visit the website BotanicalArtAndArtists.com by Katheryn Tyrell. 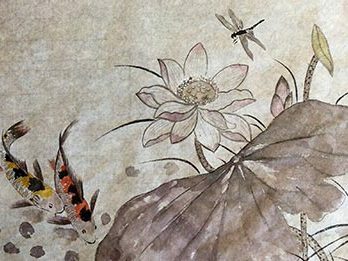 The site is a fabulous resource about botanical art for botanical artists & illustrators. It also has a section on the website about Botanical Illustration books which our students might be interested in viewing. One of the highly recommended books by Katheryn is available on Amazon and its called the Art of Botanical Illustration. 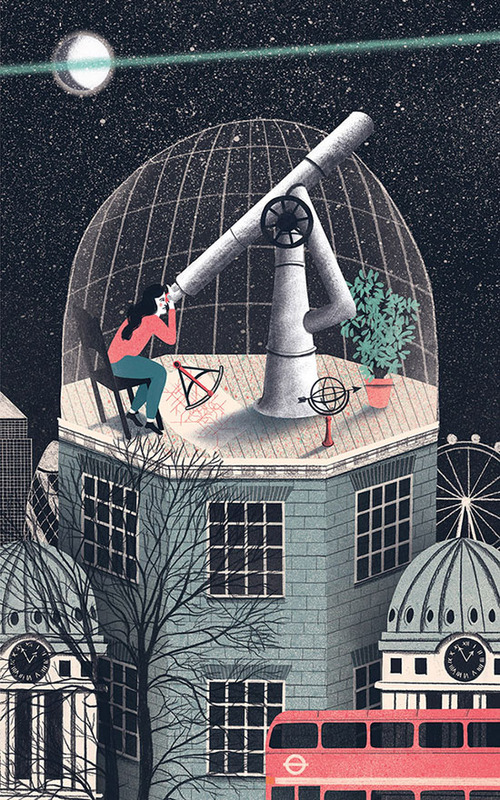 Its is a beautifully illustrated and would definitely give our students much inspiration. We hope you have enjoyed viewing Veranika’s paintings and reading our resources. If you are a Botanical Illustration student and you would like your paintings featured here, drop us a line at any time! 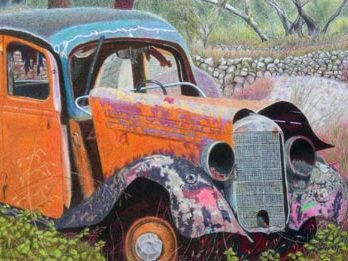 We have recently received a lovely email from Joanne Taylor who completed our Drawing and Painting Online Art Diploma Course. Joanne has very kindly allowed us to use it here on our blog and we hope that it helps inspire our current students and our prospective students who are reading this too! Today we have another amazing video by Emily Gravett. 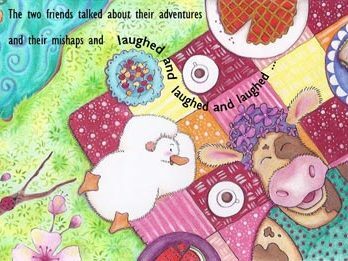 It is absolutely incredible and a must see for students who are studying on our Illustrating Children’s Book Online Art Course. Emily Gravett is a children’s author and illustrator and Emily demonstrates how she draws the imaginary girl from the book The Imaginary by A.F Harold. Emily uses a mix of traditional drawing and digital techniques. She scans the artwork and works on it digitally using her Wacom touch screen tablet. Our Digital Illustration students might be interested in watching too! Enjoy! DISCLAIMER: Please note that LAC cannot be held responsible for the content of any external sites or their content. Spencer Hill, our very experienced and friendly tutor who teaches both our Illustration Online Art Diploma Course and our Digital Illustration Online Art Diploma Course has made us aware of a new competition by the AOI – Association of Illustrators. 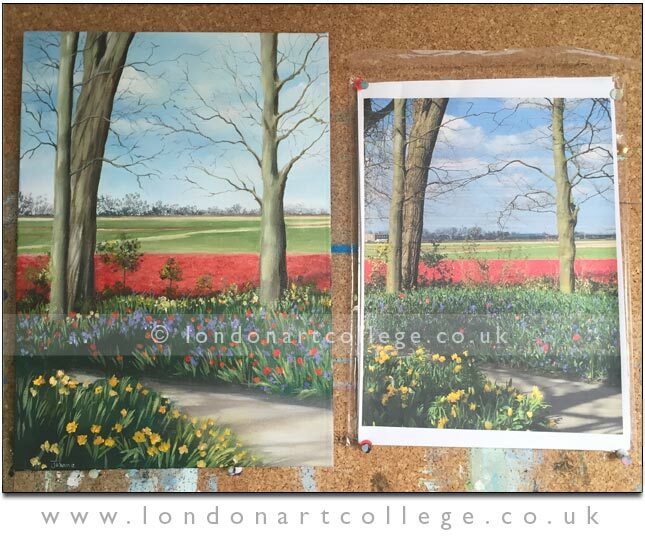 Spencer felt that his Illustration students on both courses might be interested in entering, plus it could appeal to all students of the London Art College. Let us know if you enter! 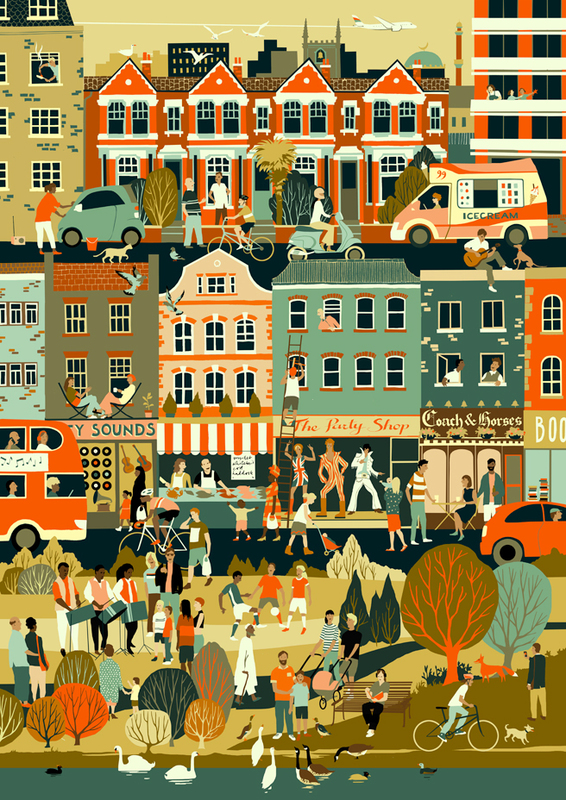 The Association of Illustrators (AOI) in partnership with London Transport Museum (LTM), is delighted to announce that submissions are now open for The Prize for Illustration 2017. This year the theme is Sounds of the City – an illustrated interpretation of urban sound. The illustration below is last years winning entry. We hope you fin it inspiring. If you enter, drop us a line with your entry and we will add it here on the blog. 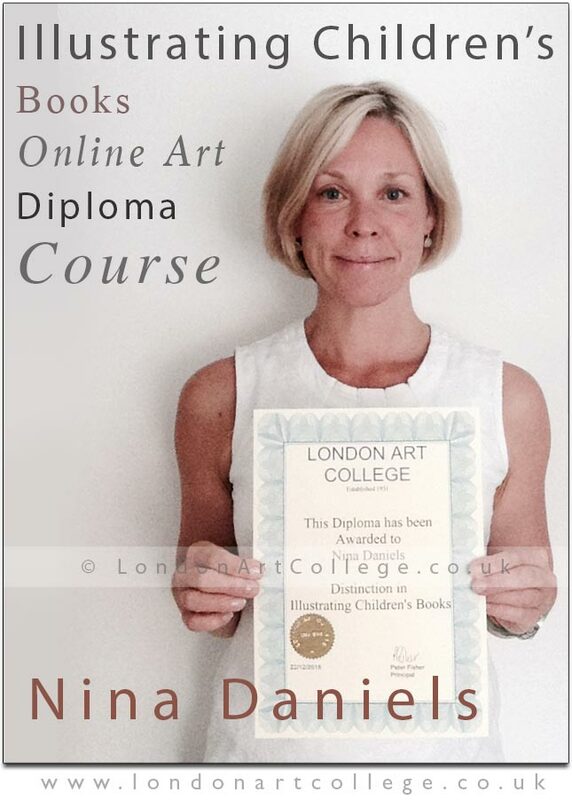 London Art College student Nina Daniels has very kindly had a photo taken of herself with her Diploma for us to display here on our college news blog. We would like to congratulate Nina for passing the Illustrating Children’s Books Diploma Course with distinction. If any of our students have photos of themselves with their diploma and artwork, we would be thrilled to feature them here on our blog. Email them to us at any time. 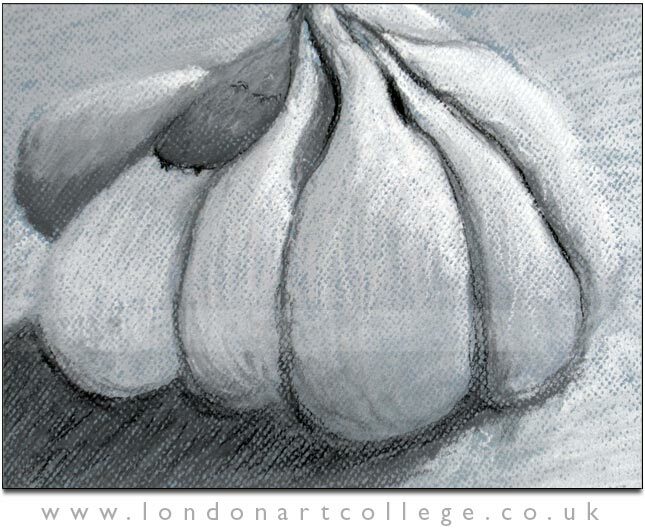 Student Ann Edwards is studying our Pastels Online Art Course and has been experimenting with the texture and tonal ranges of a garlic bulb. Ann had created a wonderful study here and we particularly like the way Ann has not defined the outline of the garlic bulb on the right and left hand side. When learning how to draw or paint, its often quite difficult, not only to describe everything within the scene correctly, but also colour mix and choose the correct colours to use. There are so many things to consider, students often find it difficult to deal with a multitude of things at once. With this in mind students are often asked to complete a study of an object or subject using greys and whites alone. What is the most aesthetically pleasing angle to view the object at? Does the object have a smooth or rough surface texture? Which direction is the light coming from? How many light sources are there hitting the object? On the object, where is the lightest light? Where is the darkest shadow? Can you see any reflective light? Are the objects edges defined or are some of the tones similar to its surroundings? So in this instance with the garlic, we have the light and shade to master, the deep shadows to build with dark tone, introduce weight of line, describe the surface texture keeping in mind the objects shape and form along with making sure the object is sitting firmly on the table with its shadow. 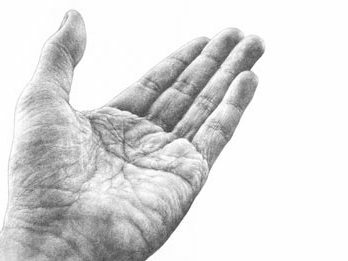 So you can see by overcoming all of these things in your first preliminary drawing, when you then create a colour version, you will be much more prepared and informed about the subject. Why don’t you have a go for yourself? This can be achieved using any subject, in any medium. Have fun! 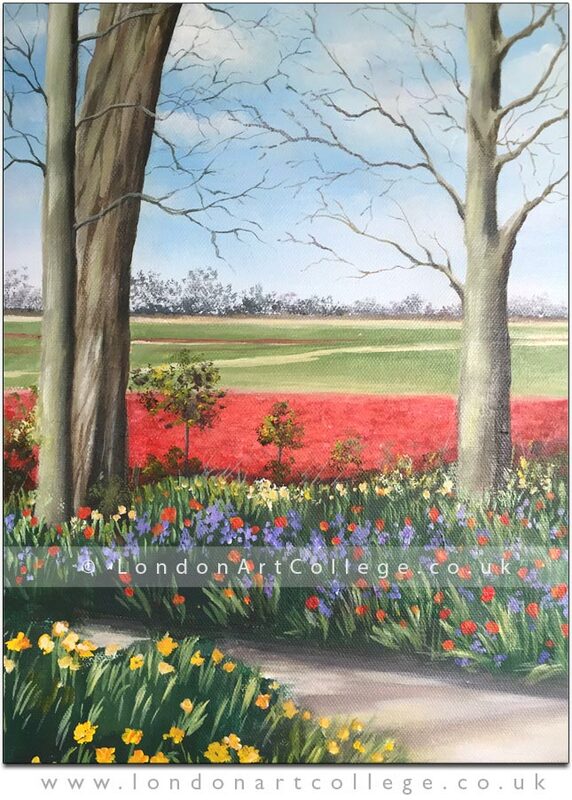 Alan Caswell created this dramatic painting of trees and a landscape whilst studying on our Landscape Painting Online Art Course. The colours and tones Alan used are really stunning. It feels as though we are looking at a vibrant, warm sunset in the distance behind the trees. The beauty of the scene is that Alan has used warm colours behind the trees and cool colours where the trees are in shadow. 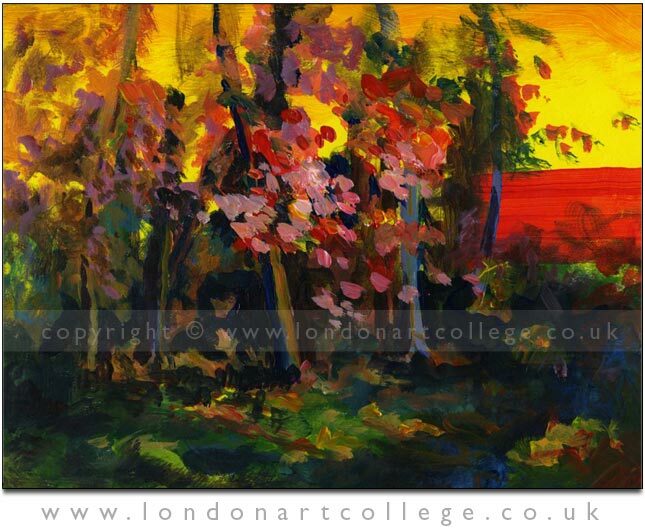 One of the rules of thumb in art are, that warm colours come forward and cool colours recede. 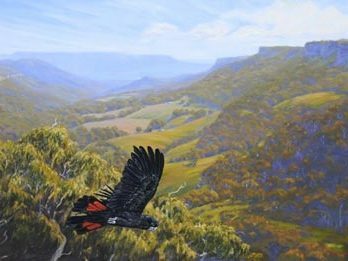 So if you were looking to create depth in a landscape where you wanted to allow the background to recede and the foreground to come forward, you might use purples and blues in the background and warmer colours like yellows and oranges in the foreground. 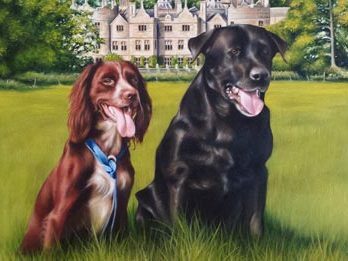 Having said this – in the painting that Alan has created, it has shown that rules can be broken! 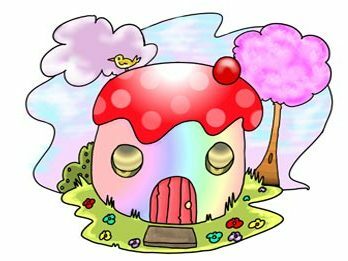 For students who are studying on our Illustrating Children’s Book Online Art Course, you might be very interested in watching the video below. Emily Gravett is a children’s author and illustrator and Emily demonstrates how she draws a dragon and then proceeds to paint it in watercolour. We thought our students who are just about to complete the Firey Fred exercises in their course may find this inspirational! We have received a notification from The BBC and thought that we would share it with our students. 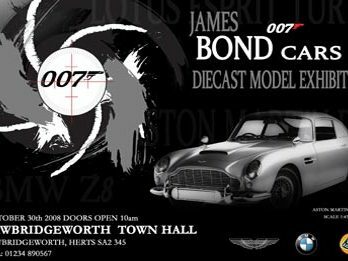 If you take part, do let us know! 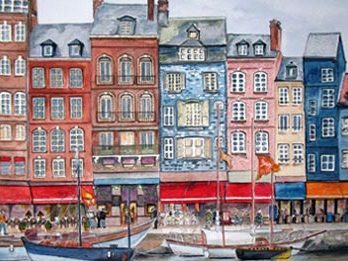 WOULD YOU LIKE TO RECEIVE INTENSIVE TUITION TO UNLOCK YOUR POTENTIAL AND IMPROVE YOUR PAINTING SKILLS? 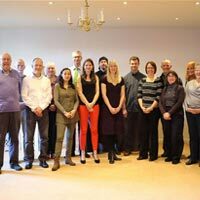 Do you think with the right coaching and inspiration you could become a truly great artist? BBC One is looking for amateur painters to take part in this exciting new show, which will give 10 artists the chance of a lifetime to discover just how brilliant they can become.